Akin to giving birth for the first time, one can never fully prepare for what is unequivocally the journey of India. Despite the many authentications made throughout history by great writers from Twain to Einstein, nothing touches the heart of the experience quite like the adventure itself. From her sacred temples and palaces, to her Himalayan treks and Goan beaches, the possibilities to adventure India are endless. Yet, one thing remains certain—she is impossible to pin down in one sojourn. She cannot be captured or labeled through words or snapshots alone, and she eludes all attempts at being contained. Like any great journey, she will put order where there was chaos, and replace chaos where once there was order. Traveling in India can be time consuming so it is best to plot your route ahead of time. A familiarity with the different modes of transportation and a back-up plan is a wise strategy in preparation for the not-so-rare event of a breakdown. Reputable hotels and government-run tourism offices can provide information about the best options for transportation. Utilizing this reliable outlet saves time, soothes nerves and allows the mind to open itself to the possibilities that await us when we step outside of our everyday existence and surrender to the adventures that lie ahead. New Delhi is a wonderful jumping-off point—the city is a bustling Mecca of new roads, government buildings, temples, museums and monuments, with shopping malls and residential communities springing up everywhere. Cows, tuk-tuks, Hondas and bicycle-rickshaws congest the streets right along with the noise pollution and the thick, palpable air. The streets are like rushing rivers sweeping up the branches and stones of every new culture, every modernity, carrying them forward, yet holding the ancient Indian foundation—the river bed. The evolutionary layers of the modern Western world collide with thousands of years of ancient civilization. In the midst of all this, India is alive in the chaos and movement of everything. One way to journey through India is to go straight into the heart of the country. Ujjain is considered one of the country’s oldest and holiest cities. Located in the central state of Madhya Pradesh, Ujjain is one of the four holy sites of the Kumbh Mela, a Hindu pilgrimage which occurs every twelve years and rotates among four locations: Allahaba, Haridwar, Ujjain and Nashik. This city dates back well before the forth century B.C.E. and was an important trade and political center as well as a hub for the development of astronomy. Ujjain is also the home to the Mahakaleshwar Jyotirlinga temple. The Lingam at the Mahakal is believed to be swayambhu, or born of itself, and is the only one of the twelve Jyotirlingams to be so. It is also the only one that faces south. This five-level temple is a rare and potent vestige of the tantric tradition. Undoubtedly, you can experience the rush of the kundalini shakti in the midst of the Pooja ceremonies (a form of worship relating to dedication and belief) which are conducted on a regular basis and visible from any of the seven flat screen televisions hanging on the walls of the main ritual room. Ujjain itself is a tranquil place and its bazaar seems untouched by time. Spices are freshly ground and sold roadside and warm buffalo milk is still delivered to homes in the early dawn. A profound force lingers along the banks of the Shipra River and in the air; it is something that transcends time. It is well worth the visit even if the absence of the Kumbh Mela. Situated in the middle of India, the state of Madhya Pradesh or “middle province” is home to several national parks, historical sites, forests and agricultural lands as well as a vast array of cultures and peoples. Bandhavgarh National Park is one of the country’s wildlife sanctuaries and it boasts the most dense tiger population in the country. Considering the undeniable brink of tiger extinction worldwide, visiting this sanctuary is a rare and coveted event. if you see a tiger in any other park in india you are blessed, if you don’t see one in bandhavgarh you are very unlucky. Bandhavgarh National Park is a pristine and eloquent whisper of tiger preservation in India. There are only an estimated 1,657 tigers left in all of India and these numbers have been declining for the past five years. 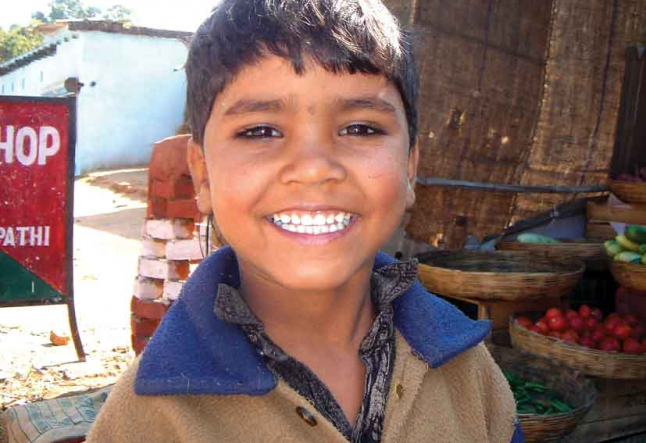 Madhya Pradesh is home to 300 of those. The country’s efforts of preservation have resulted in over fifty different tiger species living in the environs of Bandhavgarh National Park—one of which is the wild Bengal. Among the discoveries of this 437 square kilometer reserve are thirty-nine caves of unknown origin and purpose, as well as a fort dating back 2000 years. After centuries of rule under many different dynasties, Bandhavgarh became the hunting grounds of the Maharajas in the early seventeenth century. It teems with wildlife of all types: more than 250 species of birds, thirty-seven species of mammals including leopards, bears, sambar and spotted deer, as well as many varieties of snakes and other reptiles. There are ample choices for accommodations, all of which vary in price and are equipped with naturalists and guides to help guests seek out the tigers. There is a saying in India, “If you see a tiger in any other park in India you are blessed. 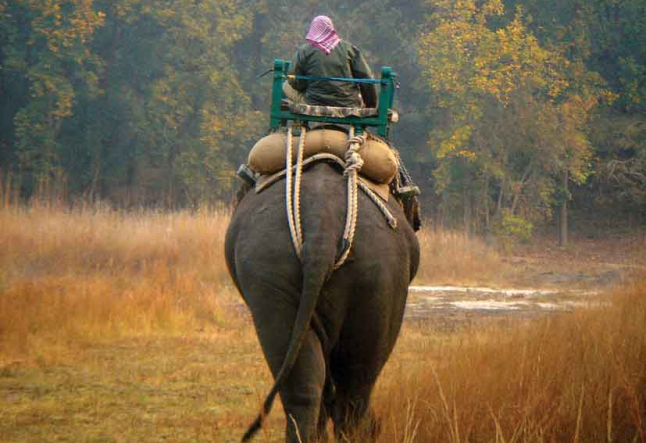 If you don’t see one in Bandhavgarh, you are very unlucky.” At first, an early morning outing can feel cumbersome with the forty to fifty jeeps, or “gypsies” as they are known, lining up at the gate in hopes of spotting a tiger. It can feel like waiting to get into a concert and is at first, a bit chaotic and noisy. Nevertheless, the pristine silence of nature engulfs everyone and the anticipation of spotting a tiger quickly disintegrates all lingering displeasures. The thrill of the chase is contagious and a good guide will help stoke the fires of your tiger-gazing desires. India’s powerful sense of humanity will find its way to you; opening up to her is an act of sheer surrender. After hours of scanning the camouflaged landscape with weary eyes, frozen fingers and aching bottoms, hearing a monkey sound his “a predator is near” alarm will make the hair on the back of your neck stand straight up. Feeling the presence of this awesome creature is breathtaking. It is a blessing to witness this powerful being in the wild—royal, fearless and full with its own essence—it is a mystical experience. After a sighting, the world seems more luminous, more vibrant. Even the dust seems lighter. Upon returning to the camp, it is common for guests to share tiger-sighting stories over a satiating meal and somehow the stories get better and juicier as the night goes on in Bandhavgarh. 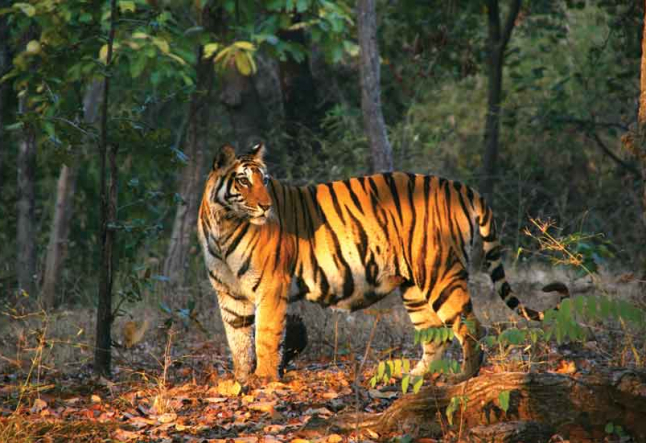 With a tiger adventure under the belt, an exploration of Bandhavgarh’s other fine attributes is in order. On the way to the old fort on the most prominent hill, you can visit the 1200 year-old Vishnu statue where tigers are known to leisurely drink from the surrounding pond in the summertime. Viewing the sun through the trees, illuminating this unusual Vishnu, is a must-see. The fort at the summit has a simple but potent Hindu temple with a Brahmin priest who performs Poojas for a few rupees. Like the mother of all souls, India spreads herself thick into every crevice, into every nook and cranny, dipping into the belly, filling every passage, infusing, permeating, covering, and then spilling out into rhythms, voices, smells and textures of everything and everyone. This great mother shares her wealth with all who visit. Her gifts extend beyond ashrams and yoga retreats and will unfold into whatever package you most need in order to receive her abundance and complexity. Somehow, regardless of intent, she finds her way into you, sharing her stillness, her depth, her beauty, her divinity. India’s powerful sense of humanity will find its way to you and opening up to her is an act of sheer surrender. India knows the blessings of life’s true journey.